General pain in the neck is one of the most common types of neck pain and is usually caused by pressure on any of the joints and nerves in your neck. rotation, but it must also allow the free flow of nerve impulses to the head, face, hands and the rest of your body. Besides discomfort and annoyance, chronic neck pain is a sign that something is wrong. A thorough examination can determine if you’re a good candidate for chiropractic neck pain treatment. These tests may involve your ability to turn and bend. Muscle tone of the supporting muscles in the neck may be tested. Diagnostic imaging to reveal the underlying structure of the spine may be requested. These and other tests are designed to identify the cause and location of your neck pain. 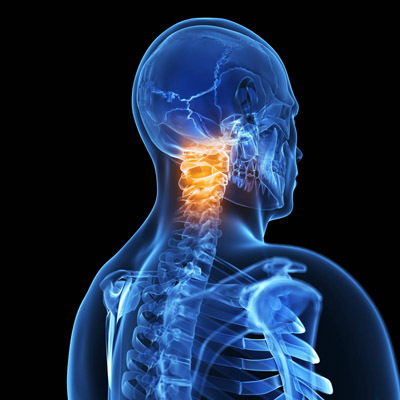 Most of the pain-sensing nerves in the neck are located in the pairs of facet joints on the back side of each vertebra. These smooth, interlocking surfaces allow you to rotate your head and bend your head up and down. If these joints become locked or fixated, neck pain can result. Chiropractic neck pain treatment can help restore proper joint motion. Ever meet someone who was a “pain in the neck”? Each of us is susceptible to our body’s unconscious response to people and circumstances. These perceptions can show up as episodes of neck pain. If the weakest link in our bodies is our neck, stress shows up there. While chiropractic care cannot reduce the stress of your busy life, it can help improve your ability to handle and tolerate it. Without drugs or surgery! Some patients see quick improvement and then immediately discontinue their care. They often suffer a relapse since muscles and soft tissues have not had time to fully heal. Others discover that degenerative changes to their spines make periodic check-ups a worthwhile investment. We’ll make recommendations, but how long you benefit from chiropractic care is up to you. If you are experiencing neck pain, arrange for a consultation with Mind & Body Chiropractic today, Gold Coast specialists in neck pain treatment.